Although you may not think about it, the state of your gutters can affect many other areas of your home, including your foundation. If your gutters do not function properly, it could pose a threat to the overall integrity and safety of your home, lower the property value, or lead to foundation repairs and water issues. The most common problem that homeowners face with their gutters is that they fail to drain or channel excess rainwater far enough away from the home. If water is not able to travel through the gutter, it is most likely because the gutter has become clogged with leaves or debris. This is especially common in the autumn season when the trees are dropping their leaves. If you have clogged gutters it can often lead to costly foundation repairs that require extensive labor. 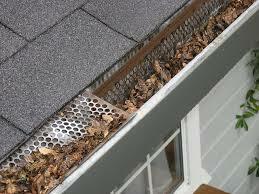 Having your gutters regularly cleaned (at least once or twice a year) can prevent such problems from arising. If your gutters have become clogged, it is important to understand and check for any other foundation problems that they may have caused. Overflowing water from clogged gutters will most likely end up pooling around your foundation. Over time, this excess water can lead to the erosion of soil around and underneath the foundation. The water could also leak directly into the basement through existing cracks in the foundation or basement walls, leading to multiple foundation issues, and water damage. Erosion and pooling water around your foundation will weaken it, eventually causing foundation cracks or a shifting or settling foundation. These are serious problems that should be repaired as soon as possible by a professional foundation repair contractor. There are some telltale signs to look for when trying to determine if you have a settling foundation or sinking foundation. If you notice leaning walls or bowing walls in your home or in your basement, it is a good indicator that something is wrong with the foundation. Another quite obvious indicator may be foundation cracks, wall cracks, or even ceiling cracks. Sticking windows and doors are another good sign that your foundation is in need of repair. Sometimes, a damaged foundation may even lead to a wet basement. If you find any of these problems with your foundation, contact My Foundation Repairs for the expert service that you need to take care of all your foundation repair needs. My Foundation Repairs offers a variety of foundation repair services to ensure that your home is returned to normal in the shortest amount of time possible. The most common fix for most of the above problems is to raise the foundation back to its original position by a method called underpinning and then seal any cracks that may have formed in the foundation or walls. To do this, we use helical piers or steel push piers to support the foundation. These work by drilling into the stable soil underneath any voids that may have been caused by erosion or shifting soil. Then the weight of the house is transferred onto the helical pier or steel push pier and the house is raised to its original position. We also provide epoxy and polyurethane grout crack injection to fill any cracks that may have formed and ensured that water does not leak through them and into your home. My Foundation Repair offers top solution for all of your foundation repair issues. We use quality methods and reliable materials from ECP (Earth Contact Products) to guarantee the welfare of your home. Don't let clogged gutters get the best of you; contact us for a free estimate today!